Summer is the season that church people ease up, but based on the scriptures we’ve read the past few weeks; our summer slowdown comes during Jesus’ busiest season! Jesus is out there working miracles like the feeding of the 5,000 and walking on water to rescue the disciples. There are no dramatic miracles this week. This week, we see Jesus as a man. Perhaps more human than we’d like and more human than we know how to deal with. Jesus is caught with his compassion down, and it’s not a pretty picture. This is always a tough story. It’s difficult to talk about this story without making Jesus sound at best insensitive, and at worst — a jerk –in his treatment of this poor woman. There are ways to try to soften it. Bible scholars tell us the translation from the Hebrew doesn’t mean dog exactly — as in a scavenger dog scrounging for food on the streets — it means puppy. That doesn’t make me feel any better about Jesus’ reaction. You? Jesus ignored her. I think this is the first time we’ve seen him ignore anyone. He allowed himself to be drawn in by the disciples – those same guys who were often irritated by people trying to get close to them. Their work was so much easier without people crowding around! And when Jesus does get around to speaking to her, …rude doesn’t begin to describe the name-calling. Remember Jesus was on her turf. He was in her country, among her people. If it had been anyone else but Jesus, we’d say he was prejudiced against her. That Jesus could be prejudiced shocks us, but the story ends with an even bigger surprise. The story ends with Jesus changing his mind. He went from being dismissive to being persuaded. Persuaded that he was wrong in his first response. Persuaded that she was someone to listen to. We might say he flip-flopped. Oh, the press would have jumped on that! We don’t react well to a leader who changes his mind. People want a leader who believes he’s always right, ready to take control of the situation, decide on a course of action. What are we to do with a leader who is at the mercy of others? Especially an other who is of seemingly little importance like this Canaanite woman? But let’s not get ahead of ourselves here because if we spend all our time talking about why Jesus did what he did, there won’t be time to talk about the very person he ignored. And she’s far too important to ignore. Let’s not get ahead of ourselves. You know that expression. We use it to describe how we assume that something will happen before it’s absolutely certain. We’d be getting ahead of ourselves if we bought a wedding dress and sent out invitations before there was a proposal. We’d be getting ahead of ourselves if we started high-fiving and fist-bumping before we’ve actually won the game. We put don’t at the beginning of the phrase as a warning. Don’t count on something that may not happen. I’m using it in a different way this morning. There’s no don’t, and rather than it being about something that may not happen, this is about what’s already real. It’s just that we’re not ready for it yet. Getting ahead of ourselves is living into a reality that we’re not ready for. We have Jesus as our example. Jesus wasn’t ready for the reality that this foreigner was as much a child of God as any of his disciples. Jesus wasn’t ready for the reality that a woman was deserving of his time and as deserving of his mercy as anyone else. He wasn’t doing anything wrong according to what was acceptable in his culture. She was a woman and a Gentile. He was allowed to ignore her or to call her anything he wanted. Maybe one day, Jesus would have been ready to realize that his mission included her. But he wasn’t ready that day. He wasn’t ready. She was. And so, she challenged him. She used his metaphor about a dog and one-upped him. She questioned his attitude. And convinced him that something larger was at stake. Her humanity. Jesus says it was her great faith that convinced him. As for what that great faith looked like – all we can see is that she manages to hold to what she believes is right. She talks back to his power. She answers his prejudice. For her daughter. We mustn’t ignore her daughter either. What does Jesus change of heart and change of mind say to us? Last week I suggested that you name the knots in your stomach. This week I suggest that you name who it is you are not ready for. Name who is your Canaanite woman. 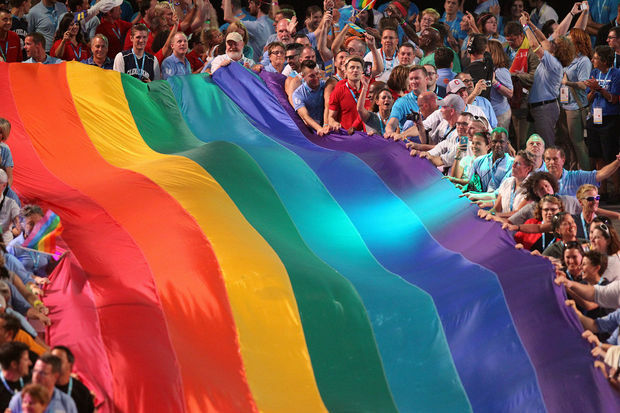 Last night was the Closing Ceremonies for the Gay Games that were hosted here in Cleveland. 10,000 LGBT athletes from all over the world were here to compete, and thousands of supportive friends and families were here for the fun. It was a great time and a week-long party. Disciples Christian Church was a community sponsor of the games, and several of us participated in a variety of ways. The support for being a community sponsor came with a broad swath of support across the congregation, but I’m pretty sure the support was not universal. I wouldn’t expect it to be. Maybe because of your inherited attitudes or some verses from scripture, you were uncomfortable with your church’s position. Maybe your discomfort started when we walked in the Cleveland Pride Parade just a few weeks prior to the Games. Or, earlier, last summer when our denomination passed Resolution 1327, Becoming a People of Grace and Welcome to All. You would not be alone. Full acceptance of the LBGT in our faith communities has not come easily or quickly or universally yet. 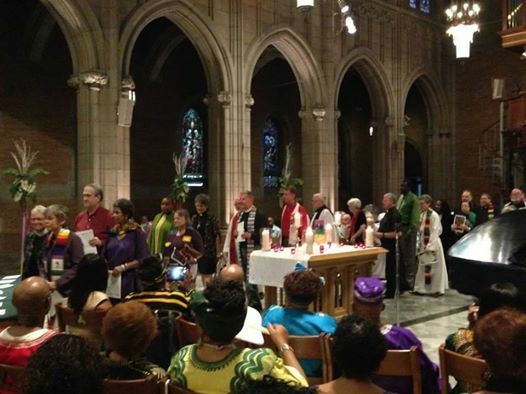 I had the privilege of being part of the procession of clergy at the Interfaith Worship for the Gay Games at Trinity Cathedral last Monday evening. There were 4 of us from this congregation, but this is not about us. We are not clergy who have been forced to hide who we are in order to do the work God has called us to do. That night we heard testimony from several who have. 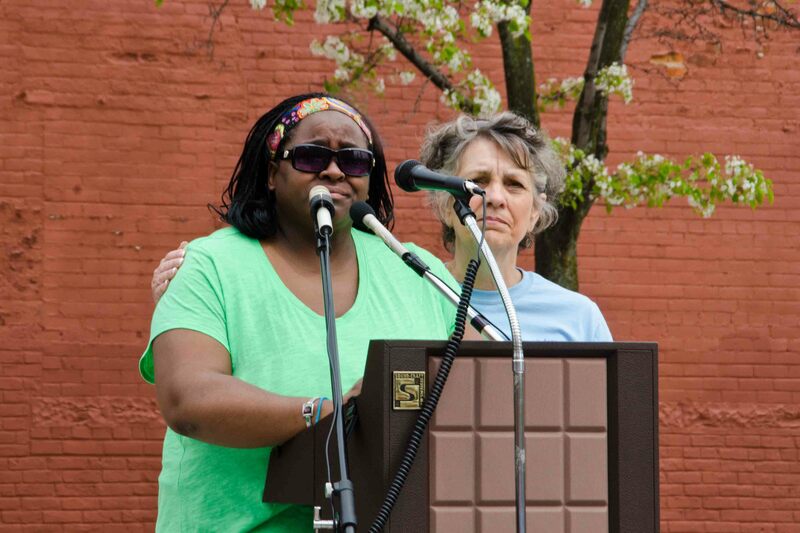 One voice came from my friend and colleague, Rev. Allen Harris, who serves as pastor at Franklin Circle Christian Church in Ohio City, spoke of a dark time in our own denomination’s recent history. In 1991, the election of the Rev. Dr. Michael Kinnamon to the position of General Minister and President was rejected because he refused to declare that homosexual acts were always sinful and that sexually active homosexuals should not be ordained. Kinnamon wrote: Disciples are not single issue people; we are gospel people. It is not the defense of homosexuality that we proclaim, but the primacy of grace, in light of which all of us are found wanting and through which alone all are bound in a community of forgiveness. 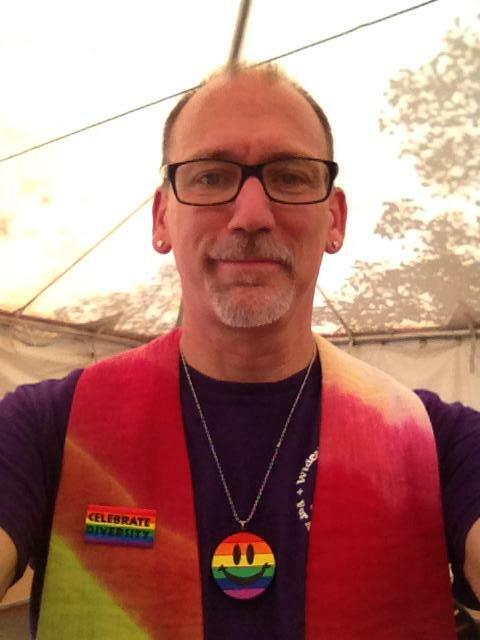 It brought tears to my eyes realizing that Allen, who is an openly gay man – and a fine pastor — continued to serve in a denomination that refused to recognize and accept who he was for all of those years. I began to see more clearly than ever before that we are are witness to great faith in persons who are holding on. Holding on and accepting their call to be persuaders. Persuaders just like that Canaanite woman. Persuaders calling us to get ahead of ourselves and our prejudices and into the reality that all persons are God’s children. The other reality we’re not ready for is being a country where our race does not determine our future. I remember a conversation I had with a long-time member of our church who died a few years ago. She was someone we’d call a pillar. We were visiting one afternoon in her living room when the conversation turned to Barack Obama running for president. It was just weeks before the 2008 election. She wanted us to pray together that afternoon that our country would accept him and respect him as our first African American president. We prayed believing that our country was entering a new chapter in which the color of our skin would not keep us from being whoever we were called to be. Our hope kept us from seeing that more unaccepting and disrespectful chapters would be written before the one in which our country became post-racial. We do not live in a post-racial America. It did not arrive in 2008, and we’re still looking for it in 2014. It is real that God loves all children equally. It is real that God demands justice and offers mercy to all, sadly there are still many in our country for whom that is getting ahead of ourselves. It is impossible to be a pulpit this morning and ignore the tense situation in Ferguson, MO. One week later after the shooting of Michael Brown, we still do not know the details of how and why he was shot and killed. Much is being disputed. What is not being disputed is he was shot multiple times, and he was unarmed. 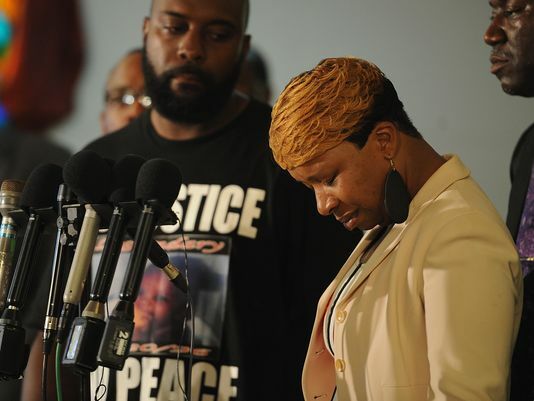 It is agonizing to see another mother whose child’s future was stopped by a bullet. In the work that David and I do in ending gun violence, we’ve had the privilege of meeting many mothers who have lost their children to gun violence. 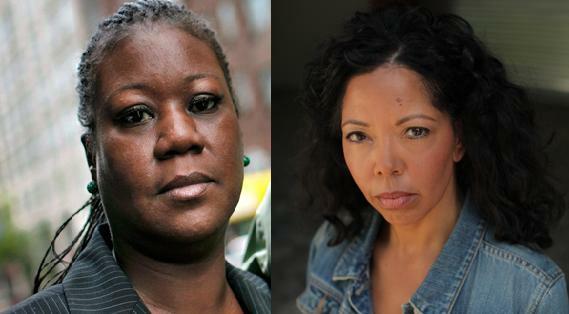 We’ve heard them speak through their tears as activists who are determined this not to happen to another woman’s child. Lucy McBath, whose son Jordan Davis, unarmed, was shot and killed at a convenience store in Florida because someone thought he was playing his music too loud. Sabrina Fulton, mother of Trayvon Martin, unarmed and killed because he looked suspicious to a self-appointed neighborhood watchman. Dionna Perry, whose son, Brandon Young, unarmed, was gunned down here in Cleveland. We add Lesley McSpadden to that group of mothers. These mothers are determined that we will not ignore them. Making sure that we know this is real even if we don’t think we’re ready to know it. So, I thank God for the persuaders. For that Canaanite woman who started it all by persuading Jesus to change his mind. To redirect his mission. To enlarge his concept of who deserved God’s mercy. And I thank God for all those who have followed. I’ve named just a few. I know you can come up with other names. The people who demand to be treated as human beings. Fully human in the eyes of God. The people who insist that we listen before we’re ready to hear it. The people who persuade us to get ahead of ourselves. Getting Ahead of Ourselves. It’s time. 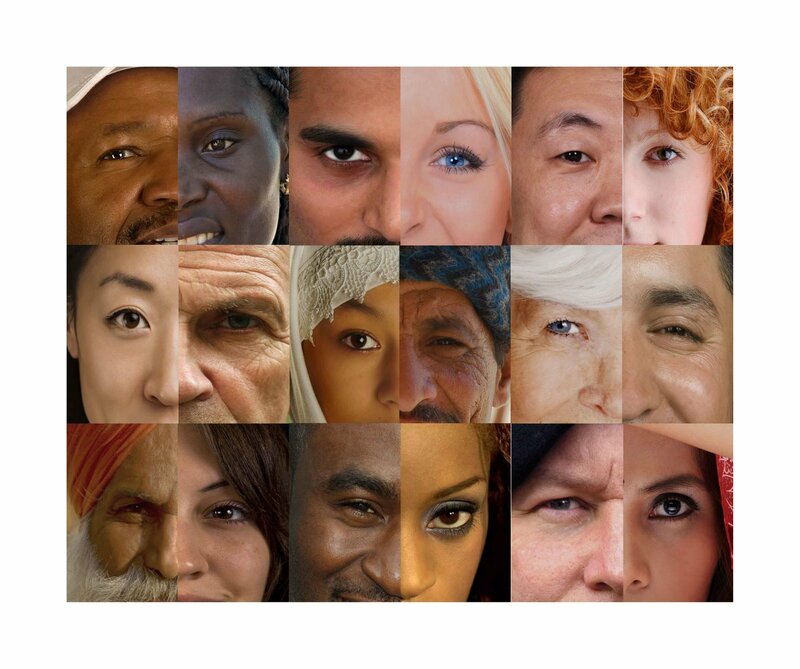 Perhaps you’ve heard the statistic that our country will no longer have an ethnic majority by 2043. And even before that, in 2018 (only 4 years from now), our country will have no ethnic majority among those under 18 years of age. It’s time we get ahead of ourselves. Jesus answered the challenge. Jesus had a change of heart and he changed his mind. Let’s follow him as we have promised. This entry was posted in Activism, Ending Gun Violence, God Before Guns, Good News, gun safety, LGBT, Loss of Child, Moms Demand Action, Multi-cultural, Racism, Uncategorized. Bookmark the permalink.